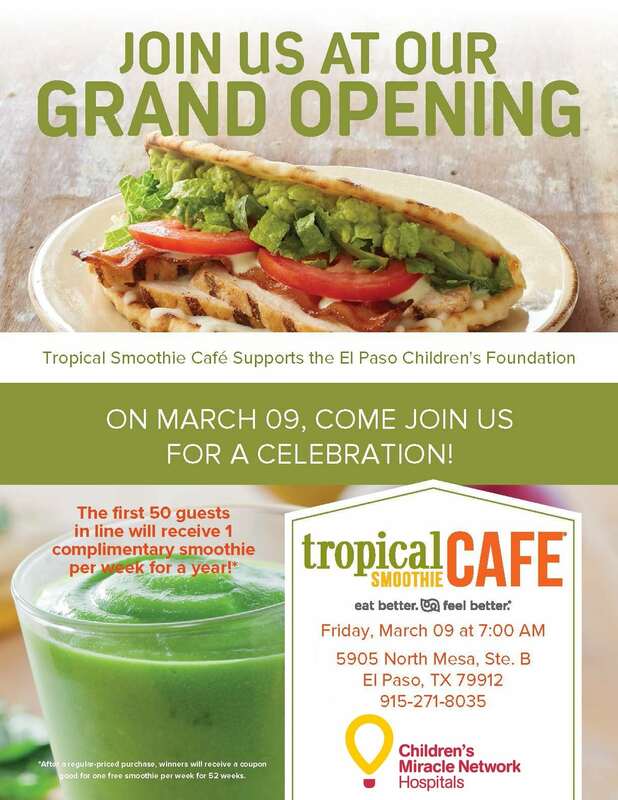 Tropical Smoothie Café will be opening its west El Paso location with a grand opening celebration on March 9. The franchise’s third El Paso location is at 5905 N. Mesa St., in the shopping center off Sunland Park Drive. Beginning at 7 a.m. on March 9, there will be raffles, games, giveaways and a special menu. The first 50 people in line will win one free smoothie per week for a year. The franchise owners are partnering with the El Paso Children’s Hospital to help raise funds for the hospital. The owners hope to raise $10,000 during the grand opening, and proceeds raised through games and raffles will go toward the cause. Anyone who makes a $1,000 donation will receive one free smoothies for a year.Tropical Smoothie serves wraps, sandwiches, salads and smoothies. Next post: Today is the day. It’s National Pancake Day at IHOP!